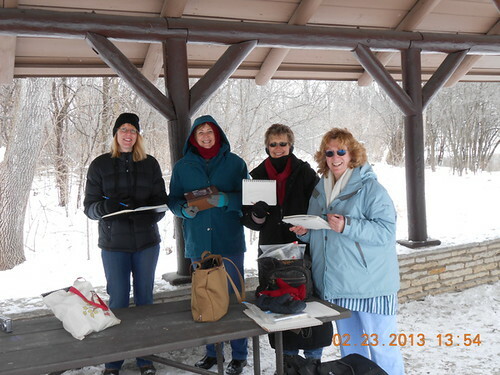 Blind Sketch Location, Great Event Fullersburg Woods – Let's Paint Nature! 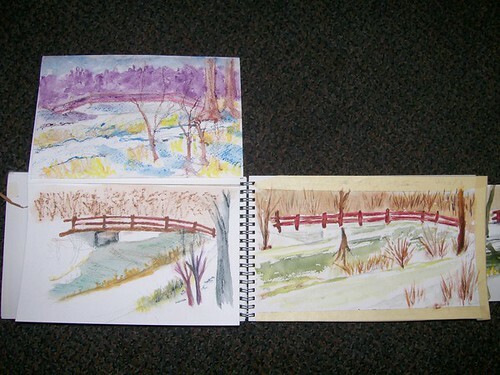 As a Meet-Up organizer to the Chicagoland Sketchbook Hikers group, I can schedule sketch class where ever and when ever I want, but the best part of the deal is that members can suggest a location all on their own to the Meet-Up site and create a future event. Exciting because it is a place I’ve never been before, but a little nerve racking because it’s a place I’ve never been before, and as the sketch teacher I have no idea what we are going to sketch until I get there! Well, this wonderful Meet-Up event suggested by Celeste, was a great idea. The group met at the nature center where we decided how brave we were, to sketch from inside or to hike and sketch outside. We were brave cookies and decided to take a chance by hiking to this lovely shelter on a tiny island at Fullersburg Woods in Oak Brook, IL. Now it was freezing, so all we could do was make a quick graphite outline and finish with color later inside the nature center. Freezing but well worth it as we had a splendid short hike to the island while discussing our love for art and nature. We jotted down colors to remember and finished inside. These lovely sketches were done my Jan, Donna, and Alanna. This is my sketch which I was able to scan in for better viewing. 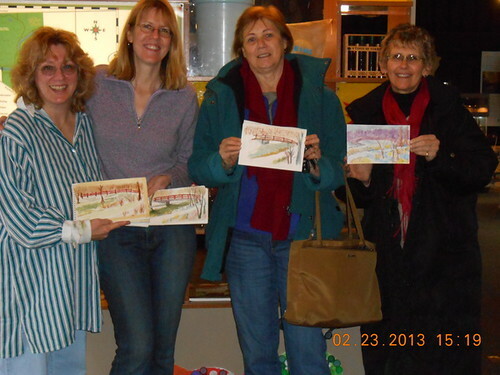 Here are our wonderful nature sketchers that braved the mean Chicago weather, to appreciate nature and take a piece home with them too! 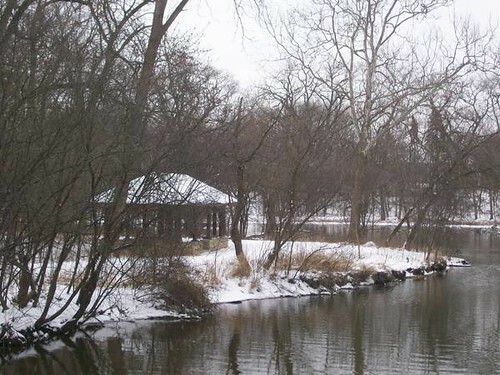 Check out the Meet-Up site, if you are in the Chicago area maybe you would like to join? You are a tough bunch! Nice work, ladies! Thank you..I’ll pass the word!!! beautiful! wish we coulda been there!! Gene, me too…Hope all is well with the family. I am very impressed that you worked outside. 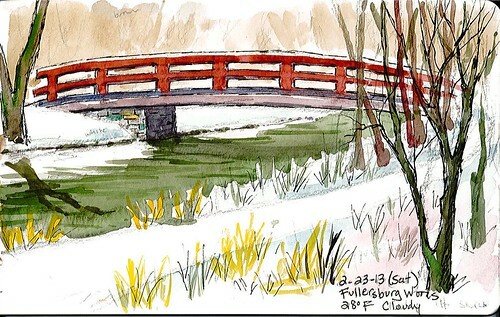 It’s looks very cold but am glad you got such good results–nice watercolors. Thanks! We were lucky not to have a strong wind and were able to face the cold. is the time to see if any of the members are interested in a hiking art group! Thank you, Jean. And what a great idea about the group. Ask around the guild…I bet many are willing, especially when it gets warm out! Bravo to all! Looks like a great location, and yes, when there’s an island involved, ya definitely gotta go for it! !– well done! Thanks a bunch, Mark!! I really have a great time meeting all these lovely artists. We have a blast too!